Olive oil helps your body absorb important nutrients from tomatoes, such as antioxidants lycopene and beat-carotene, when eaten together. The Italians have been onto something for centuries! This side dish, or snack, is great during the warm summer days. It's also a great side for a tapas night! Quick and simple is my food prep game, and this recipe can be whipped up in no time. As always, I encourage you to play with the amount of herbs and spices I've listed to better suit your tastes. 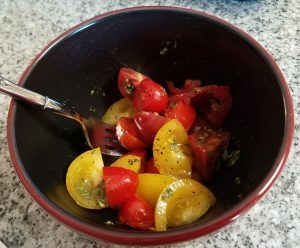 Cut up tomatoes into bite-sized pieces and place into a bowl. Sprinkle over the tomatoes: dried parsley, dried basil, garlic powder, and black pepper. *If you have fresh parsley and/or basil, use about 1-2 fresh leaves instead. Drizzle olive oil and red wine vinegar over everything and stir.